1. True or False - A tennis court must be made up of certain materials. 2. The service boxes are _____ feet long? 3. The main advantage of playing on or having a clay court is_____. 4. True or False - The only requirement for the surface of a tennis court is that it should be level and smooth. 5. The arrows are pointing to which lines? 6. The arrow is pointing to the? 7. True or False - The server must not touch the baseline until after the ball has been struck. 8. This is a picture of a _____court. 9. If a ball lands on the line is the ball in or out? 10. The arrow is pointing to which line? 11. Why should singles sticks should be used in singles matches? They don't need to be used. To signify what courts are singles courts. To keep the net at the proper height near the singles sidelines. To help make the net more sturdy. 12. This is a picture of a _____court. 13. Grass courts tend to favor what playing type? 14. The red area is called the? 15. Hard courts tend to favor what playing style? 16. The most difficult surface type to play on is a _____ court. 17. The slowest playing surface is a_____? 18. The net post is how many feet above the ground? 19. The main disadvantage of a grass court is_____. 20. True or False - Clay courts tend to have relatively short points whereas grass courts tend to have longer points. 21. The two shaded areas are called the _____ service boxes? 22. This is a picture of a _____court. 23. What is the name of this line? 24. True or False - A band, often called the "net tape" must cover the net cord. 25. The two shaded areas are called the _____ service boxes? 26. A clay court tennis player will tend to play mostly? 27. True or False - The spacing between the net and the post can be up to six inches? 28. The width of the court for singles play is ____ feet wide? 29. Hard courts can vary in speed because_____. the texture of the paint. the court surfaces all have a uniform speed. weather like rain and heat can change how the ball will bounce off the surface. the differing amounts of sand and other hard particles. 30. Tue or False - Hard courts are tough on the human body. 31. The length of a tennis court is____ feet long? 32. The net post must be_____feet away from the court. 33. Hard courts are the most common type of tennis court because_____. they are cheap to maintain and don't require much maintenance. they are inexpensive to build. they are more forgiving on the body. 34. True or False - The proper orientation for a tennis court is North/South as to avoid the glare of the rising and setting sun. 35. Balls bounce_____ on clay courts then on other surfaces. 36. 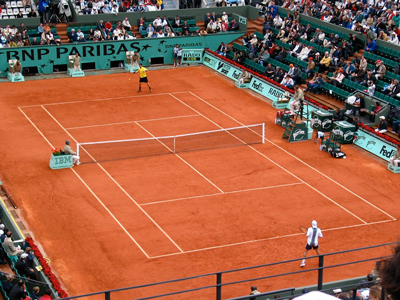 True or False - Clay courts are composed of varying material and vary in speed. 37. Most clay courts are not made of clay, but are made of_____. 38. The main disadvantage of playing on or having a clay court is_____. 39. The height of the net at the center of the court is_____feet? 40. True or False - When playing doubles a serve landing in the doubles alley is considered a good serve as long as it bounces before the service line. 41. 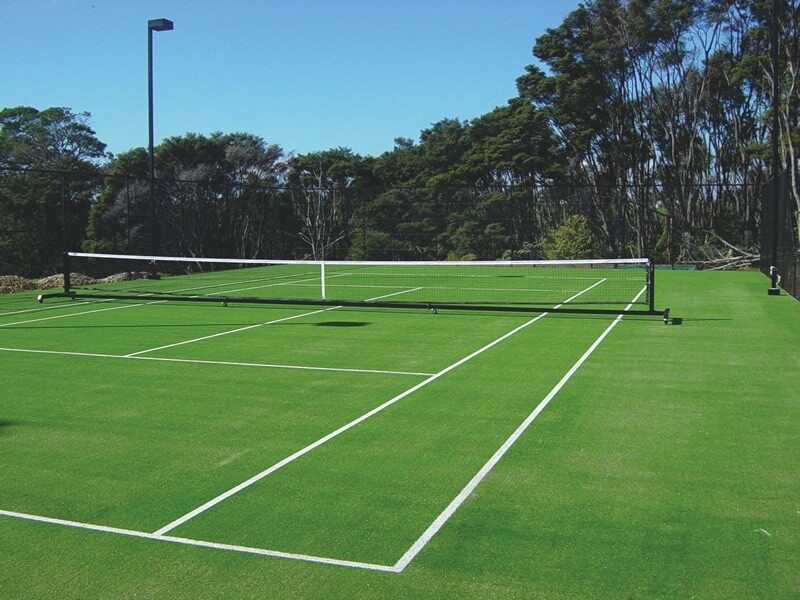 True or False - Grass court surfaces tend to maintain there characteristics during a tournament. 42. The width of the court for doubles play is ____ feet wide? 43. The predominate playing surface until the 1970's was_____? 44. The red area is called the?